Collins joins Sens. John McCain of Arizona and Rand Paul of Kentucky as GOP "no" votes. Unless one of them switches their position, Republicans can't muster the 50 voted needed to pass it. Momentum for the bill sputtered Monday morning even after a new version was released by authors Sens. Lindsey Graham of South Carolina and Bill Cassidy of Louisiana that included new incentives to appease the concerns of a handful of uncommitted Republican senators. GOP leaders faced a Saturday deadline to pass Graham-Cassidy with a simple Senate majority, and it's still unclear if they will put the bill up for a vote without the votes for it to pass. Leaving a leadership meeting, Sen. Orrin Hatch, R-Utah, said, "I doubt it" when asked if Senate Majority Leader Mitch McConnell would bring the legislation to the floor for a vote. And that was before Collins had solidified her position against it. Collins' opposition caps off a months-long effort to repeal the Affordable Care Act after years of campaign promises to do so. Senate Republicans failed to pass three other versions of a repeal to Obamacare in late July when Collins, McCain and Sen. Lisa Murkowski, R-Alaska, all voted against it. Murkowski has not yet indicated her position on Graham-Cassidy. "Today, we find out that there is now a fourth version of the Graham-Cassidy proposal, which is as deeply flawed as the previous iterations," Collins said in a statement announcing her opposition. "The fact that a new version of this bill was released the very week we are supposed to vote compounds the problem." Collins announced her position despite last-minute changes to the bill to get remaining holdouts on board. An analysis of state-by-state health care funding shows that under Graham-Cassidy, Maine would see a 43 percent increase in federal health care funds, Arizona would get an additional 14 percent, Kentucky 4 percent and Alaska 3 percent. 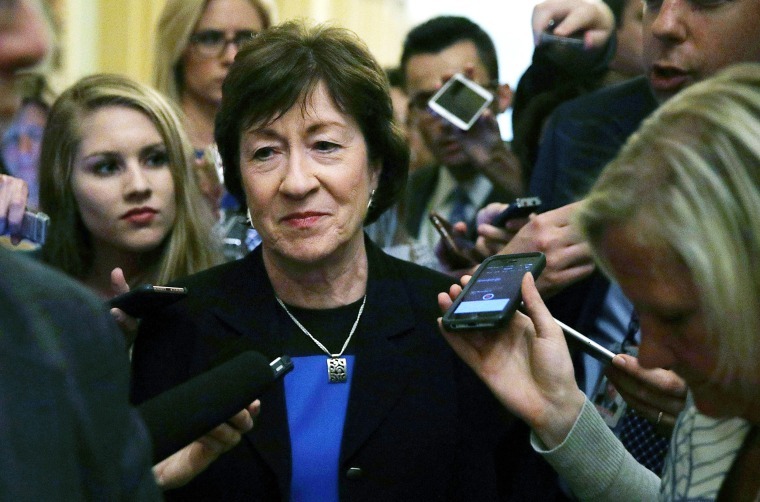 But Collins said that despite the positive numbers, "Maine still loses money under whichever version of the Graham-Cassidy bill we consider because the bills use what could be described as a 'give with one hand, take with the other' distribution model." "Huge Medicaid cuts down the road more than offset any short-term influx of money," she said. Collins announced her position after an incomplete analysis of an earlier version of Graham-Cassidy by the Congressional Budget Office found that "millions" would lose their health insurance under the plan. The rushed process to meet a Saturday deadline for allowing passage with just a simple majority frustrated a handful of senators, including McCain who had more problems with the process than with the substance. He came out against the bill on Friday. In an effort to calm the critics on process, the Senate Finance Committee held the first and only hearing Monday afternoon on the legislation. It turned out to be highly attended by passionate activists worried about their health care being stripped from them. Protestors filled the hallways outside the hearing room, snaking around the corner and down the length of a city block. Hundreds of people chanted "shame" as Graham entered to testify before the committee. Voluminous protests inside the hearing room delayed the start of the hearing. Hatch, the committee's chairman, tried to gavel in the committee but protestors drowned him out. Police dragged them out, many disabled and in wheelchairs, one by one. The Capitol Police said Monday night that 181 protestors had been arrested at the demonstration. Once the hearing began, protestors maintained their chants in the hallway outside, their voices seeping through the doors. The Association of Health Insurance Plans and Blue Cross Blue Shield released prepared testimony before the hearing stating that they can't support Graham-Cassidy. Graham testified that Obamacare was a “disaster” in his state and boasted that "every major insurance company opposes our bill,” saying it was evidence that his legislation would give states more flexibility in dealing with them. The loosening of the regulations on insurance coverage was seen as an attempt to help conservatives come on board. Marilee Adanski-Smith came from Wisconsin on Saturday to attend the hearing. She was born without arms and legs and relies on Medicaid. Garrett Haake, Elyse Perlmutter-Gumbiner and Frank Thorp V contributed.